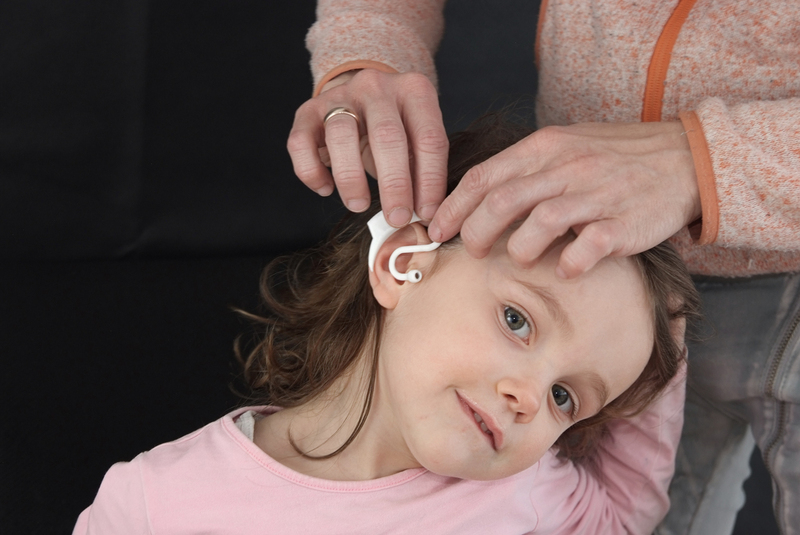 The new degree° thermometer for kids is guidng the placement of the thermometer device in the ear by its ergonomic design. A good placement of the infrared sensor is key for an accurate measurement of the body temperature. 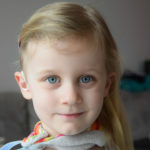 After you once applied the device, your kid can wear this small, light and soft thermometer in her ear as long as she is in a feverish condition. The temperature curve inside the app shows the temperature zones from normal to increased to fever in a green, yellow and red colour. The LED on the back of thermometer shows the same corresponding colours. 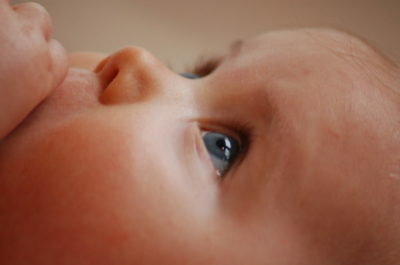 Now you can always keep an eye on your child‘s body temperature anytime and anywhere without measuring it. 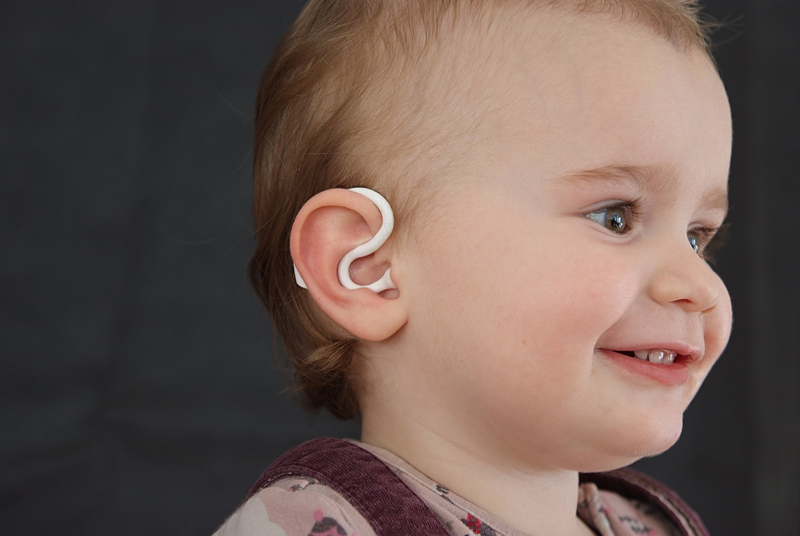 The lightweight thermometer fits securely in children‘s ears during day and night. The wearable is very well tolerated thanks to skin-friendly material und ultra low radiation. The long-lasting battery life of 5+ days guarantees an unworried usage in times of fever. Knowing when to talk about fever and what to do is depending on many indicators such as age, gender and actual disease. 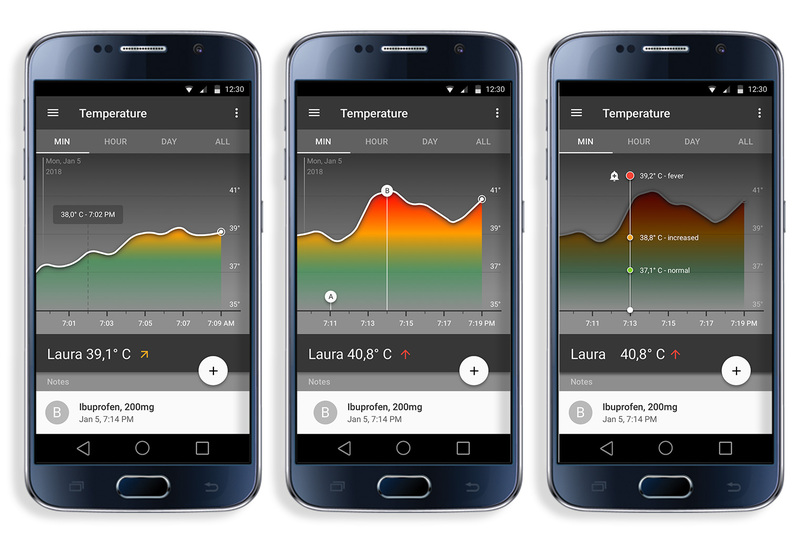 Inside the degree app, you can comment on the temperature measurements to create a detailed fever diary. The continuous temperature curve can show you which treatments worked best . Your kid has a temperature? Then you have a story to tell. P hysicians will tell you to take your child‘s temperature every hour no matter if day or night. All values should be noted down manually to compare them afterwards. The degree° thermometer will do that automatically without bothering you and your child every hour. Taking the temperature has never been easier and more safe. 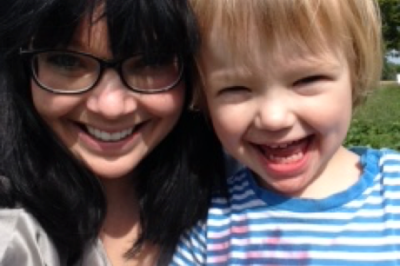 The first febrile seizure came without warning. My child was very devoted that night, but i did not know, if that was because of it‘s teeth or due to an infection. The degree° thermometer helped me to monitor the temperature better and therefore to find out which treatment worked best. In the beginning i was quite skeptical, if my daughter will tolerate the thermometer in her ear. But just as i applied the soft device to her ear, she already forgot about it. Degree° is a clever combinationof technology and convenience. A useful wearable in my opinion. The main trigger for a seizure are changes in temperature. Especially at night we never found a bareable solution to monitor the temperature. Most of the seizures happened sadly at night while she was sleeping. Degree° is a great assistance to see the temperature trending while your child is sleeping. Degree° is a great invention made by a passionate team. After experiencing the first complicated febrile seizures of my son, i was constantly bothering him with those old fashioned medical thermometers. Thanks to degree we can now automatically take the temperature in feverish times. Both of us can now recover stress free. Always keeping an eye on your child’s body temperature has never been easier. degree° will help you to understand how to fight fever right. The degree° thermometer is made of soft, skin-friendly and durable material. The sensor and the lens can be cleaned with common disinfectants. 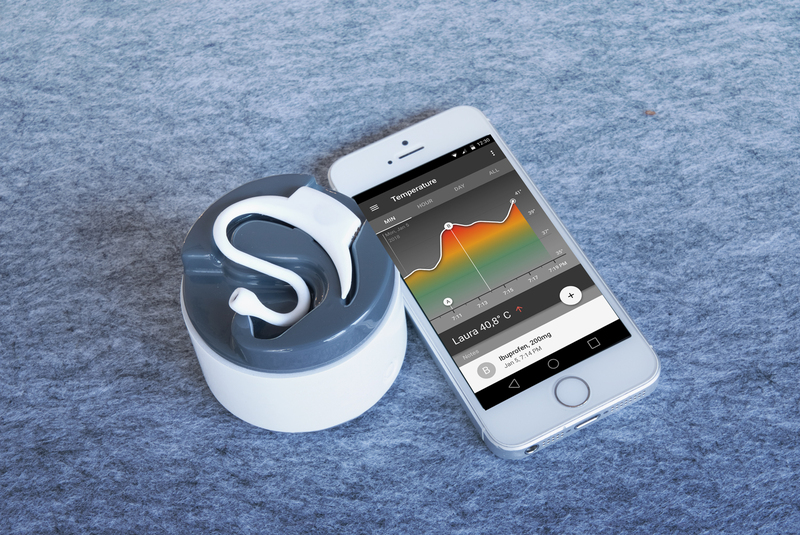 The degree° wearable comes in a charging box, where it is safely stored and always ready to use. This Bluetooth thermometer lasts for 5+ days continuously. degree° is one piece of very flexible material, protecting all the inner components. Small children therefore are not be able to swallow or destruct the device. Accurate measurements in real-life conditions, that is what you can expect of degree°. How accurate is the temperature? The degree° in-ear thermometer is pre-calibrated and uses a thermal infrared sensor that passively measures the heat radiation of the eardrum, plus the radiated heat of the surrounding auditory canal. In this way it is then possible to determine the absolute temperature of the measured object, i.e. the eardrum. The body temperature shall be measured with an accuracy of +/- 0,3 °C within the range of 34,0 °C to 43,0 °C. Is the thermometer easy to use? The medical thermometer degree° is addressed to non-professional persons, such as parents who want to easily monitor their child‘s temperature. The intuitive product design, the high usability and the practical descriptions do ensure a correct and safe handling. The colored temperature displays on the device and in the app let you recognize the temperature quickly during day and night. The measurements and the data storage are configured to work out of the box. 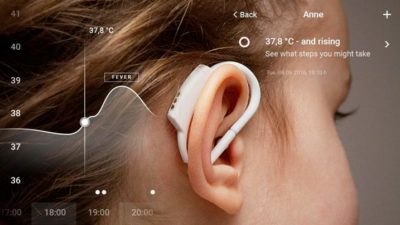 The medical product degree° only shall be used to measure continuously and in a non-invasive way the body temperature in the human auditory ear canal. 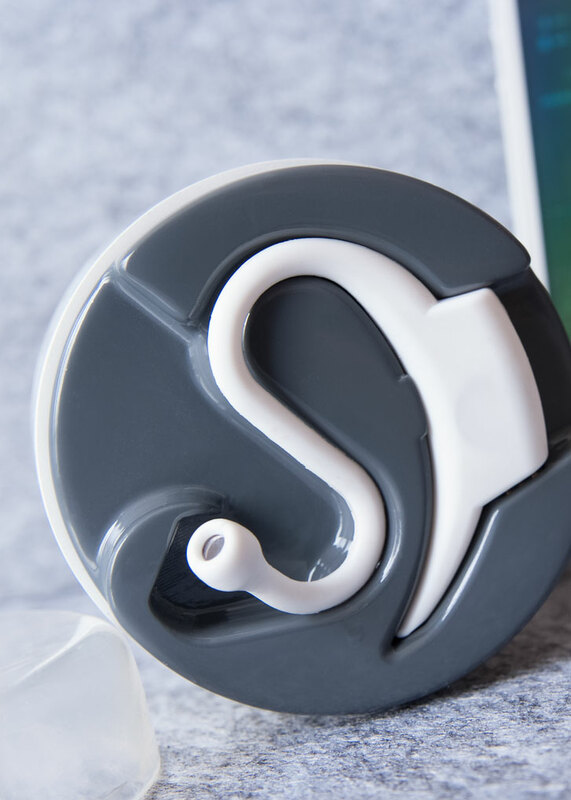 As a reusable and wearable device, it is intended for home use on children and adult people innovating the way of tracking and taking the temperature. 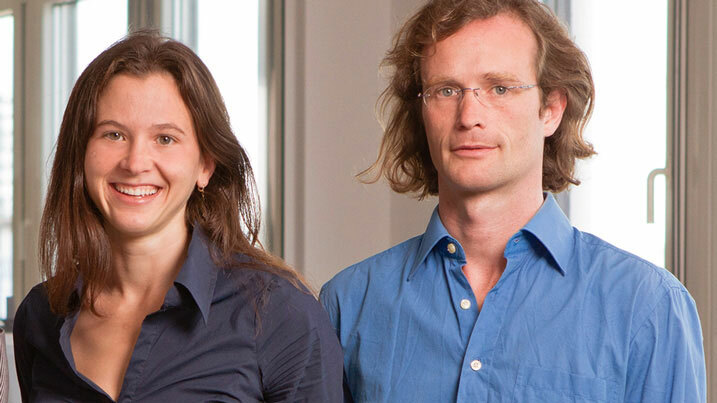 Greta and Johannes founded cosinuss° in September 2011 based on the findings of the PhD work of Johannes, which focused on developing the first wearable medical devices for home use. Starting in the field of research and enabling technology, cosinuss° provided in the very beginnings research institutions and companies who care about the health of their customers, with enabling technology. The first consumer product, cosinuss° One, was introduced to the market in mid 2016. The °One is a performance tracker for professional athletes to balance health and performance, health being the critical driver of performance. Since then, it found its way into professional areas of triathlon, Formula 1 racing, sailing, motorsports, fire fighters and swimming. In 2017, cosinuss° started a successful Kickstarter campaign to launch its second consumer product, degree°. 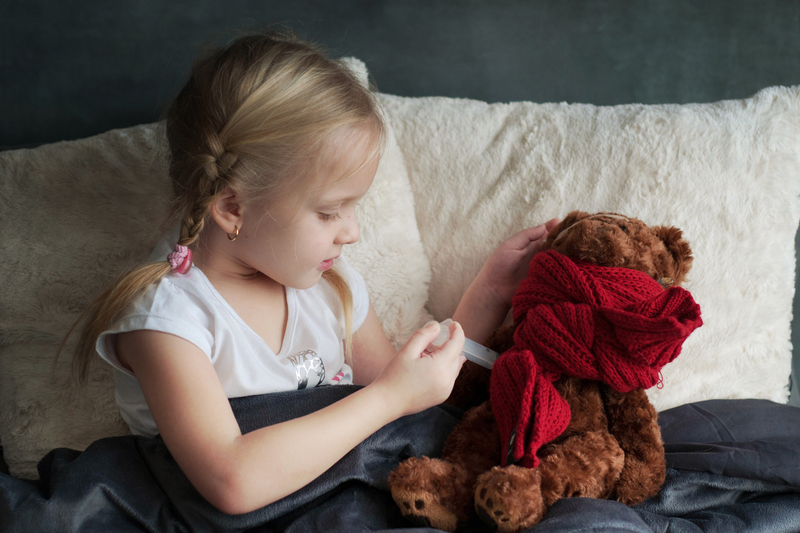 degree° is a smart digital fever assistant that continuously measures core body temperature of the child and helps parents making decisions based on it.